We are very pleased to report that a substantial bequest has been left to the CRS under the will of Mrs Patricia Payne, who passed away on 15th July 2015. 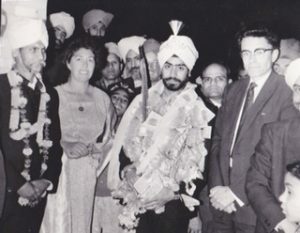 Pat and her husband John, shown in picture attending a wedding, lived in various cities in Pakistan and India over a 17 year period. During their posting in Calcutta, Pat worked as a teacher at the Cathedral School. They both retained an abiding love for the two countries and Pat kindly remembered CRS in her will. 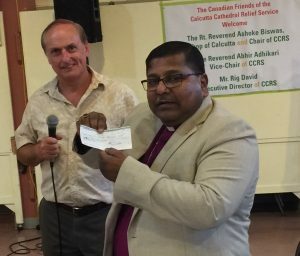 The UK Friends of CRS are managing the bequest. To date, an initial payment of £107,000 has been received with a further amount of around £40,000 expected when the estate has been fully wound up. The bequest is being treated by the Trustees as a capital sum to be invested in the long term and ensure the future viability of CRS. Read the full press release. 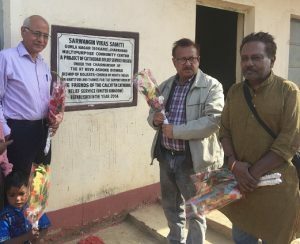 Larsen and Toubro, the Indian multinational conglomerate which has been supporting CRS activities for some time, donated three new sewing machines. They were formally handed over at the end of April by a senior member of the company’s HR Department. The machines will be used as part of CRS’s empowerment programme which offers skills training to adolescent girls and women. CRS instructors offer year-long courses in tailoring, embroidery and knitting. 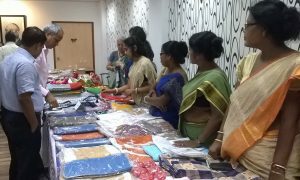 The women are also taught financial and business management skills so that they can set up their own small enterprises. 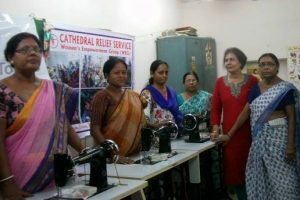 Khatiza Begum, an instructor at CRS’s Bibibagan centre, said “I am very excited on receiving the new machine and this is going to help more women to take the tailoring course”.